It feels like I’ve said this before, but I think there were quite a few teams that had good drafts. This draft may not have had an abundance of elite players but I thought the depth of it at a lot of positions was great and that led to some teams having an easy job to do. As always, we will not know who the true “winners” and “losers” of this particular NFL Draft are for another 2-3 years, but these were the drafts that I liked the most right off the bat. It pains me to put the Packers on here but the fact that they traded down and got another first round pick for next year and then used some of their excess capital to trade back up to get the player they wanted was pure genius. 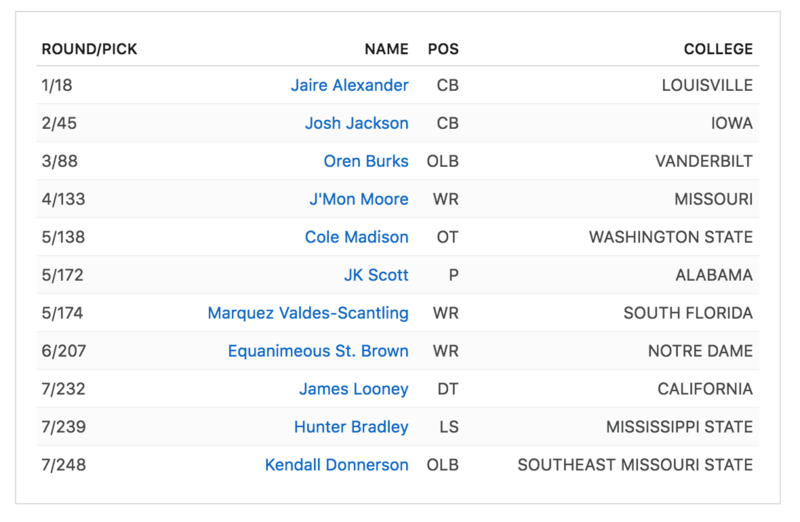 Jaire Alexander and Josh Jackson make this draft a win on its own and give them a phenomenal pair of starting CBs, even if they’re rookies. I like Oren Burks and J’Mon Moore; Moore will have the chance to contribute right away. James Looney will also provide some depth and getting to learn from Kenny Clark will help his development. Their early picks were so good that even taking JK Scott, a punter, and Hunter Bradley, a long snapper, could not bring it down. Drafting a long snapper AND/or a punter are pretty high on my “do not do ever” list, but hey, can’t win them all. It’s not a great sign for the Lions that two of their division opponents just had great drafts and one of them played in the NFC Championship game last year. Roquan Smith is a plug and play starter and the best linebacker in the draft. James Daniels is a hyper athletic center and a great value at pick 39. He could start off at guard for the Bears, but he’ll be their center of the future. Anthony Miller was wildly productive at Memphis and pairing him with Allen Robinson will give Mitch Trubisky some actual options at WR for a change. Add in the Trey Burton signing to go with Jordan Howard and Tarik Cohen and the offense actually has quite a few weapons. It’ll be interesting to see if Mitch Trubisky can actually play football or not, because the Bears no longer have excuses regarding the talent around him. Bilal Nichols is an intriguing DT and Kylie Fitts is an athletic pass rusher. If it weren’t for injuries, Fitts might have gotten drafted in the 3rd or 4th round. The Denver Broncos had a real strong draft this year. They fell into Bradley Chubb and got one of the most talented WR’s in Courtland Sutton in the 2nd round. Then they added Royce Freeman to help replace the depth they lost by cutting CJ Anderson…these first 3 picks will contribute right away. Then they went and got Isaac Yiadom, an underrated CB, and Josey Jewell, who was a productive linebacker in the Big Ten. Adding DaeSean Hamilton and Troy Fumagalli will help them continue to remake their passing game. Fumagalli gives them a legit pass catching option at tight end and drafting Hamilton after Sutton shows that they’re prepping to have a succession plan after Emmanuel Sanders and Demaryius Thomas. I’m not sure that rolling into the year with only Case Keenum, Paxton Lynch and Chad Kelly at QB is the best idea, but they certainly did not reach on Chubb at #5. I would have liked their draft more if they had taken Josh Rosen, but all things considered, this was a highly productive draft that will have immediate contributors and also shows they have a plan for the future. One of the keys to success in the NFL is planning ahead, that’s why the Patriots are continually at the top. The Chargers made the best pick of the first round by simply standing pat and catching a falling Derwin James. James is an elite safety and will help their secondary tremendously. Uchenna Nwosu is also one of the best 3-4 pass rushers in this draft and was a great value at pick #48. You can see that defense was their focus with their first four picks being all defensive players and secondary was a major focus. Kyzir White is a hybrid safety that will help in run support and cover TE’s and Justin Jones is a solid depth tackle. All three of their late picks shifted to the offensive side of the ball and I’m not sure that any of them will end up starting, but they all will be solid depth role players. 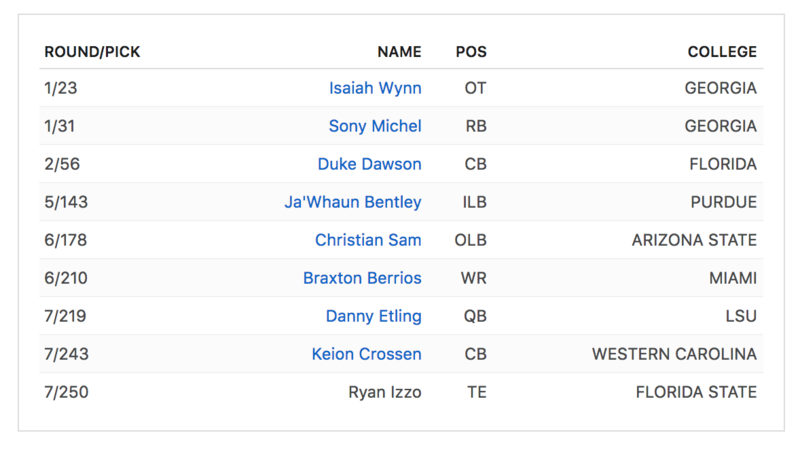 I do not love Sony Michel in the first round and I think drafting Danny Etling at all was absolutely pointless…but they took some good players. Isaiah Wynn could start anywhere on the line except for center and it would not shock me if he actually played tackle for the Patriots. Sony Michel had a solid year, but his injury history gives me pause. If he stays healthy, he’ll be a good contributor for the Pats but I’m not sold on him being in the league for a long time which makes me question his first round value. If they had taken him later, I would have loved the pick because I do not hate Michel as a player. Duke Dawson was supposed to be a star after Teez Tabor and Quincy Wilson and he had a solid career at Florida but never became dominant. He’ll likely be a starter at slot corner next year but he does not have a very high ceiling. Admittedly, I do not know a ton about Ja’Whuan Bentley and Christian Sam but I defer to the Pats when it comes to linebackers, so let’s just assume they’ll contribute in some way. The Braxton Berrios pick was a good one and he’ll be their new punt return man to replace Danny Amendola. I’m not a fan of drafting a running back this early in the first round and I’m certainly not sold on Saquon Barkley. Sometimes I felt like one of the only ones that thought he had too many poor games to actually pan out. Passing on Sam Darnold to give Eli Manning a new toy goes against what I would have done completely. That being said, I love the Will Hernandez pick and he’ll help open holes for Saquon and keep Eli upright. Lorenzo Carter is one of the more athletic linebackers in this class and he’s got a seriously high ceiling but he’s not a plug and play starter. B.J. Hill and RJ McIntosh are going to add depth to their defensive line and Hill will contribute right away. Adding them into the mix with Dalvin Tomlinson is going to give them a fierce group up front. I do not know if Kyle Lauletta will ever pan out, but spending a 4th round pick on him after drafting Davis Webb in the 3rd round last year means to me that they’re not exactly in love with Webb. 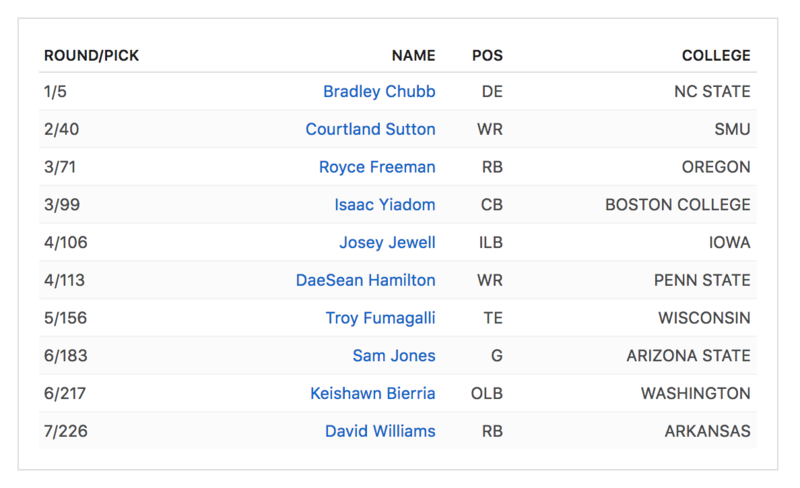 At the end of the day, I like this draft, but they took a lot of boom or bust players. If Barkley, Carter and Lauletta pan out this could be a monster class. This entry was posted in NFL and tagged 2018 NFL Draft Winners, Allen Robinson, Anthony Miller, B.J. Hill, Bilal Nichols, Bradley Chubb, Braxton Berrios, Chicago Bears, Courtland Sutton, DaeSean Hamilton, Denver Broncos, Derwin James, Duke Dawson, Green Bay Packers, Isaac Yiadom, Isaiah Wynn, J'Mon Moore, Jaire Alexander, James Daniels, Josey Jewell Troy Fumagalli, Josh Jackson, Kyle Lauletta, Kylie Fitts, Kyzir White, Lorenzo Carter, Mitch Trubisky, New England Patriots, New York Giants, Oren Burks, RJ McIntosh, Roquan Smith, Royce Freeman, San Diego Chargers, Saquon Barkley, Sony Michel, Uchenna Nwosu. Bookmark the permalink.